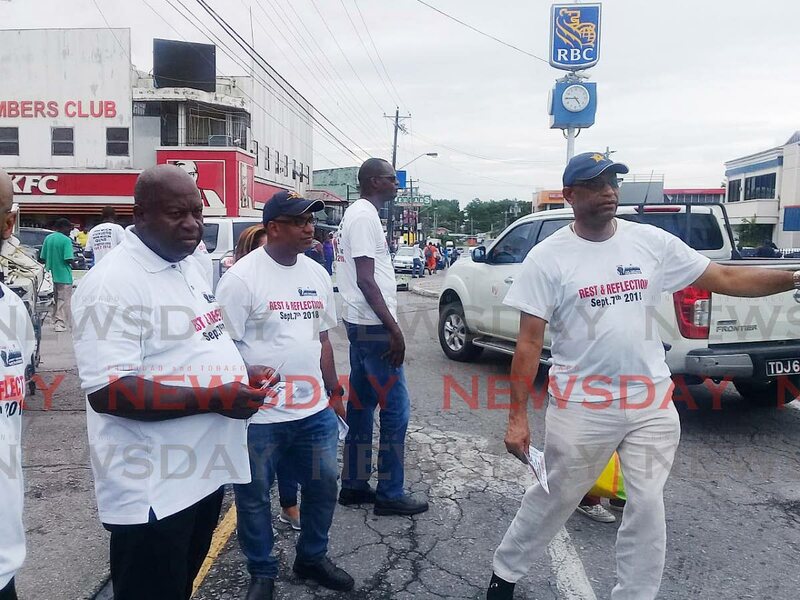 ON the busy streets of Point Fortin on Friday evening, leader of the Joint Trade Union Movement (JTUM) Ancel Roget joined union representatives to hand out flyers to the people of the borough. This was part of JTUM’s mobilisation drive to ask the working class to observe a day of rest and reflection on September 7. On the issue of Government's move to restructure state-owned Petrotrin, Roget said that there was much speculation. “This Government is going about the business of re-structuring Petrotrin in the wrong way. They are not talking with the recognised majority union and that is the biggest mistake they are bullying and badgering their way in Petrotrin,” Roget said. JTUM, he said, has several plans to deal with the situation. “If the Government does not approach the Petrotrin affair correctly, the nation should brace for a failed oil company,” he said, and claimed they were preparing to sell out the country's assets. And, he stated, the nation stands to lose by this move. “It is not just a fight for the Petrotrin workers but it is a fight for the spin-off businesses in around the plants base in Point Fortin, Fyzabad and Santa Flora,” he said. All fence-line communities will be affected, he said, and felt Government was not seeing the more fundamental part of its responsibilities. That is, he said, to make sure the country's assets are managed efficiently and effectively, in the best interest of the people. "The union has never been against restructuring but we, at the union level, have a plan, they do not have a plan. As we see, if they are taking the recommendations from their friends in the interest of their friends," Roget said. Today JTUM plans to assemble members and their families outside the official residence of the Prime Minister in St Ann's to pray for TT, for the people affected by crime and bad governance, including at Petrotrin. Yesterday, Pointe-a-Pierre MP David Lee replied to Petrotrin chairman Wilfred Espinet's statement on Friday that the company continued to operate normally and there had been no change to its routine, amid social media speculation that the army had been called in to manage its installations, and there would be a strike. Lee said he was not surprised and advised Espinet "where there is smoke there is fire" and Petrotrin workers's concerns were real. “In these hard economic times, workers are in fear of losing their jobs. The Government needs to address this issue of Petrotrin and bring some sort of clarification through the Energy Committee in Parliament." Lee said Espinet should be called before the committee to explain Petrotrin's position, adding he continued to receive reports from workers. Petrotrin, he said, does not belong to Government but taxpayers. “There is anxiety among his constituents who are employed with Petrotrin as regards to the loss of jobs,” Lee said. Espinet yesterday said the company issued a release on Friday and nothing has changed. Reply to "Roget: Brace for a failed Petrotrin"